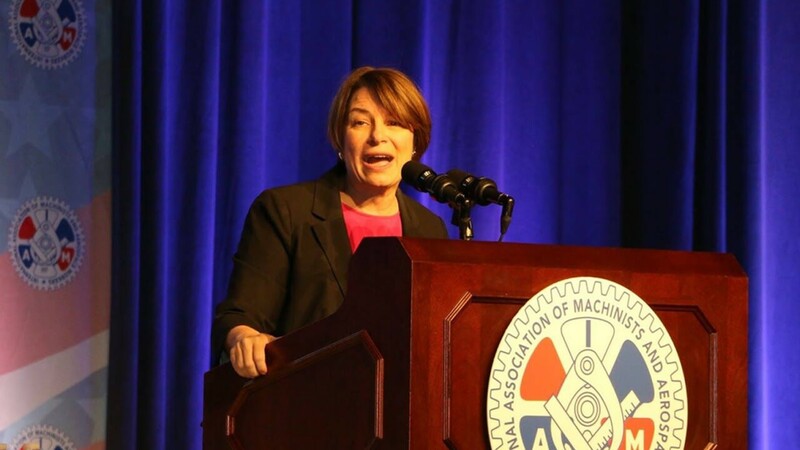 Presidential Candidate Senator Amy Klobuchar (D-Mn) spoke before hundreds of Machinists Union members at its conference of railroad and airline workers. For Senator Klobuchar, the event was the highlight of her first campaign stop in Las Vegas, where she also visited the Blind Center of Nevada and the Harold Brinley Middle School. Senator Bernie Sanders (I-Vt), also addressed delegates at the Machinists Union Transportation Conference. The Machinists Union is the largest union of aerospace and rail workers in the world. 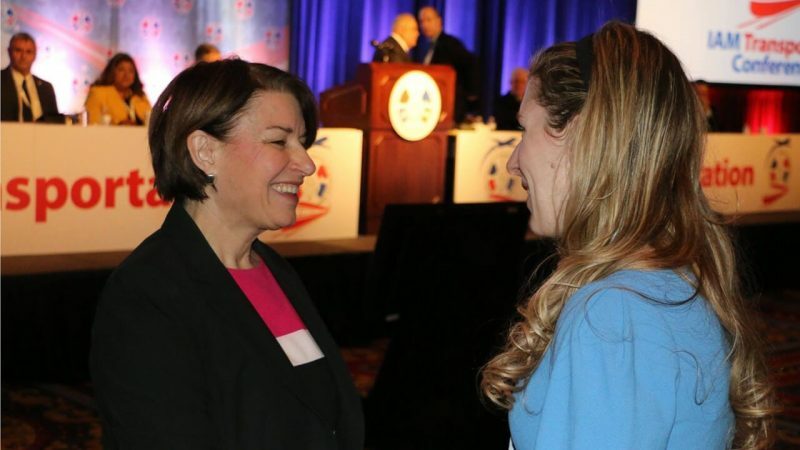 In her speech, Senator Klobuchar emphasized her close ties with unions, which Owen E. Herrnstadt, Chief of Staff for the IAM International President, praised in his introduction of the senior senator from Minnesota. Mergers were a particular area of focus of Klobuchar’s speech to the Machinists, whose members have been rocked by two recent mega-mergers. Notably, the mergers between United Airlines and Continental, and US Airways and American. But air transport is not the only industry that has endured huge and difficult mergers. The first female senator from Minnesota spoke highly of the community spirit and activism of Machinists. “And, after the devastation of Maria, you partnered with airlines to fly goods and disaster relief to Puerto Rico,” she said. 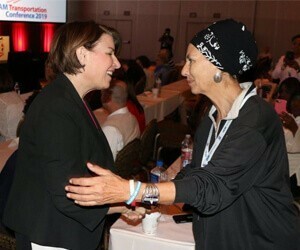 After her speech, Senator Klobuchar spent time speaking with delegates and posed for pictures. The IAM Transportation Conference assembles the top union activists within the railroad and airline industries. The event is being held this week in Las Vegas, Nevada, and will run through April 11.